I love attending conferences. They help me learn more about my business. They help me meet new people and learn about their businesses. AND when I attend non-IT conferences I also get a big dose of motivation from people who are just focused on giving and receiving inspiration. Here are a few notes from an event I've attended twice this year: 1 Life Fully Lived - http://www.1lifefullylived.org . I've already signed up for the next conference in Philadelphia in June. Check it out. I'd love to see you there. Maybe we can talk about something other than I.T. I got a note from my friend Josh Peterson over at Bering McKinley. Their excellent Service Fundamentals Workshop is coming up next week! Bering McKinley will not be offering our very popular Service Manager's Workshop again until late Spring 2017! • End once and for all your business battles. Spend two days with us and two weeks with your team and you’re company is cured. Service Fundamentals is a balance between managing the numbers and the activities of your staff. • Establish and manage your top ten service department commandments and manage to them daily. • Create job descriptions that you can manage to and make part of the day-to-day operations of the department. • Manage the entire hiring process to make sure you are picking only the best. • Understand which operational and financial KPI’s you should be paying attention to. If you can’t measure it, you can’t manage it. • If Bering McKinley advises you to do it, we always show you how to measure it. You will be an HR Expert when you leave us! - Owners who need formal training on delivering service. - Dispatchers on their way to being Service Managers. - Service Managers who have never received any real training. - Experienced Managers new to the industry. 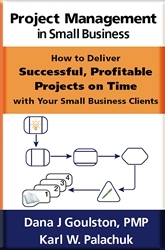 Small Business project management is simply not as complicated as project management in the enterprise. But small business projects have the same challenges as enterprise projects: They need to achieve their goals effectively, on time, and within budget. They also face the same primary challenge – staying inside the scope of the project! Find out more and buy now at SMB Books. 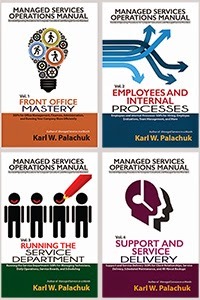 - Managed Services in a Month, 2nd ed. - Relax Focus Succeed, revised ed. Check out all of our audio and video programs at SMBBooks.com! Every year, the world eagerly awaits the announcement. This year The ASCII Group awarded their highest honor to Datto - Again! The ASCII Group, a membership-based community of independent MSPs, VARs and Solution Providers, is pleased to announce the winners of its annual ASCII Cup, with awards given to the ASCII Cup winner, Gold and Silver Medalists, and Top Distributor. The awards are presented each fall to technology companies that have showcased channel goodwill and a commitment to helping ASCII members grow their businesses. Winners are voted upon by ASCII members at regional events, and the Cup and awards were presented at the ASCII Success Summit on October 14, in Newport, Rhode Island. ASCII Success Summit attendees vote for the vendors in 12 different categories: Top Security Solution; Top Productivity Solution; Top Storage Solution; Top Cloud Solution; Top Revenue Generator; Top Channel Programs; Top Distributor; Best Keynote Presentation; Best Creativity & Innovation; Best IT Management Tool; Best Partner Incentives; and Best Market Opportunity. The winners at each Summit are selected based on the votes by the solution providers in attendance; at the end of the year, the winner of the ASCII Cup is determined by tabulating the results of all nine events. The 2016 winners of The ASCII Cup, Gold and Silver Medalists, and Top Distributor were announced at a private industry gathering at the Hyatt Regency Newport. The ASCII Group is pleased to honor the recipients of this year's ASCII Cup, for they represent the principles on which the Cup was established. The 2016 ASCII Cup Vendor of the Year is Datto. Top Four Gold Medalists for The ASCII Cup are StorageCraft, Cytracom, IT Glue and BlackStratus. Top Five Silver Medalists for The ASCII Cup are Data Deposit Box, Passportal, Connectwise, CNET and Lenovo. Distributor of the Year for The ASCII Cup was Pax8. “On behalf of The ASCII Group and our community, we congratulate Datto on winning the coveted 2016 ASCII Cup. We also wish to recognize the Gold & Silver Medalists, Distributor of the Year, and all of the companies that were featured at our Success Summits, for being committed to the channel and continuing to bring value to our members,” said Jerry Koutavas, President, The ASCII Group. The ASCII Group is a vibrant reseller community of independent MSPs, VARs, and other solution providers. Formed in 1984, ASCII has more than 70 programs that provide turnkey cost-cutting strategies, innovative business building programs, and extensive peer interaction. ASCII members enjoy benefits such as marketing support; educational information; group purchasing power; increased leverage in the marketplace; and multiple networking opportunities. These programs enable ASCII members to increase revenue, lower operating costs, and grow service opportunities. There is no good excuse to work after hours in the I.T. business. It's a mixed blessing to work in I.T. On one hand, we can access anything anytime from anywhere. (Trust me - I've handled tech support from 15 time zones away.) On the other hand, the bad news is that we are tempted to use these super powers to cut into our personal lives. When you're a sole proprietor, this unbalances your life and keeps you working all the time. But when you have employees, the problem grows to affect your entire company. You have to pay for the labor, frequently at after-hours rates. And if you pay on a salary basic, you pay the price in overworked employees who never feel like they're off work. So there's both an internal component and a client-facing component to your policy. It starts with a commitment to working normal hours. Set hours in the range of 8AM to 5PM or 9AM to 6PM. Or have people work slightly offset shifts and keep it in the range of 7AM-7PM. That gives you a few hours to remote into client machines before and after their work hours. Externally, you need to set an after-hours rate. For us this has always been twice the normal rate. Some people prefer 1.5x the normal rate. Whatever it is, it should be painful enough so that clients don't easily say yes to paying it. Most clients aren't trying to make you work longer hours for free. They're just putting in tickets and asking for help. And you'll get zero pushback if you say, "We have to charge extra for after-hours work." It's a very normal business practice. Don't forget to subscribe to my YouTube channel so you don't miss a thing. Very often the advice used by Nike promotions is great: Just Do It! But there's a right time and place for everything. Perhaps the biggest problem businesses face on a regular basis is communication. Ironically, as the means for communication has exploded, the effectiveness of communication has gone downhill. In addition to internal messaging, telephone, written, and spoken word, we now have social media, text messaging, video conferencing, and more. Communication is critical both inside your company and between your company and your clients. In both cases, we have a tendency to look at human behavior and say, "I wish people would just do their jobs." Or perhaps, "Just do what you've agreed to do." All that amounts to the advice Just Do It. Unfortunately, that's not always good advice. With clients, it's tempting to say, "Just live up to your contract." But the best contract in the world is only as good as your relationship with a client. 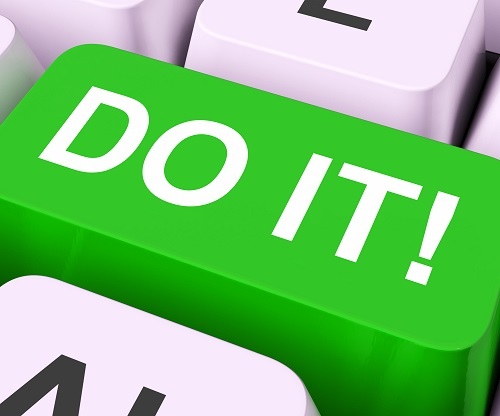 If you take the Just Do It attitude, the client is likely to do the same. And since perspective matters a lot, your client relationship can go downhill very fast if it becomes adversarial. I know someone who bought a very successful managed service business but refused to work on the client relationships. He was given the advice to meet with each client, promise them good support, and ask for their continued business. Instead, he said no: "Those people all have signed contracts. This is business and they need to fulfill their contracts." Welcome to the real world. In small business, you can't get away with an attitude like that. He slowly lost all of those clients and eventually closed the business. I'm sure there were other problems, but the Just Do It attitude was a huge factor. Internally, you have a lot more control. And sometimes you're more willing to express your frustration within your company than with clients. This can lead to short tempers and a different version of the Just Do It attitude. It can be hard to be patient with some employees, but you have to remember that employees are complex beings. Employees are individuals and they have a life outside work. In addition, they are part of your team and may be part of a sub-set of a larger team. Employees need good, affirmative communication. I'm a big fan of setting goals and targets. They don't have to be grand or even "stretch" goals. Every employee quarterly goal sheet starts out with the same goal in my company: Create positive relationships within our team and between our team and our clients. That's a written goal every quarter for as long as you work here. Other goals include a simple re-wording of the job description. For example, Provide excellent customer service. And of course there are more specific goals that individuals need to work on such as getting their time cards in on time, learning the new remote monitoring system, getting a Cisco certification, and so on. These goals matter because we also evaluate them all the time. No matter how mundane, they become a framework for a never-ending conversation about quality work and quality relationships. The more you work on communication, the better you'll get. Giving constant feedback does not have to be a formal process. HP's classic Management by Walking Around allows you to have a regular feedback look with your employees. It also works with clients. Drop by occasionally and say hello! Some level of formality is also useful. Written instructions, policies, and procedures can go a long way to clarifying communication both internally and externally. And the more you use written communication, the more you build a strong culture of interaction. So while "Just Do It" is motivating and appropriate in some settings, remember that all business is personal. Remember to take care of the personal side of communications as well.